This article is 2692 days old. 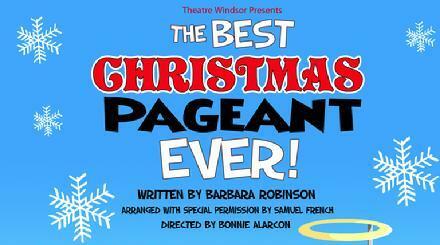 Theater Windsor presents The Best Christmas Pageant ever this weekend at the Market Square Theater. In this hilarious Christmas tale, a couple struggling to put on a church Christmas pageant is faced with casting the Herdman kids– probably the most inventively awful kids in history. You won’t believe the mayhem– and the fun– when the Herdmans collide with the Christmas story head on! The play runs Thursday to Saturday at 8pm, and Sunday at 2pm. Tickets are $16 for adults and $14 for students and seniors. Find out more info on Theatre Windsor’s website.